The busy Dover seafront has been improved with new rock groynes and changes to the seawall. The groyne works took place between groyne numbers two and eight and the seawall works between groynes zero and one. The work took place within a tidal zone and required extensive movement of beach material. The rock groyne work included the complete removal of one sheet piled groyne and the trimming and installation of four new rock groynes. A further groyne was extended along the undermined section of seawall. The new rock groynes are designed to last 50 years and are made of 1-3 tonnes of graded primary rock armour with groyne crests approximately 2.75m wide. The rock used in this project was delivered by boat from Norway. 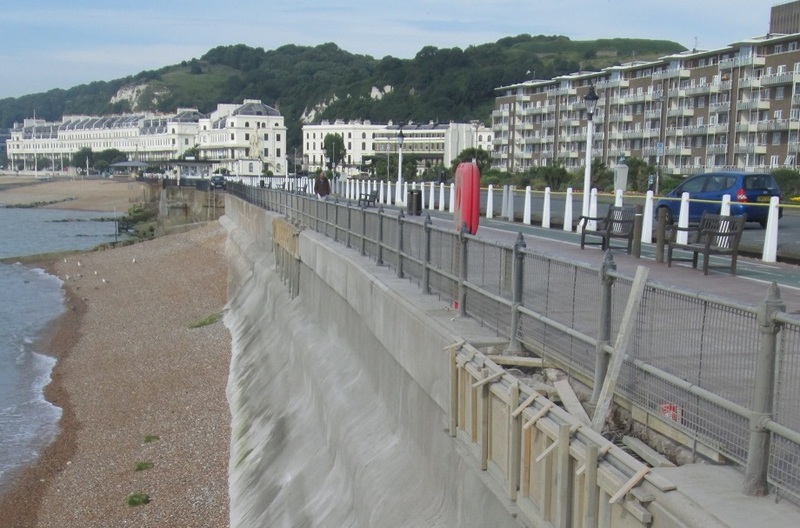 The seawall work took place between groyne numbers zero and one and included the removal and full replacement of the existing reinforced gunite on the 1922 section of wall, extensive repairs to the 1946 section of wall, and areas of coping replacement. Repairs to the wall were required as a result of consistent abrasion by the shingle beach. The wall sits within the tidal zone and the gradual loss of a section of the main wall meant that there was a danger to users of the beach from the exposed reinforcement. The successful completion of the works ensures that this very popular frontage can continue to be used by the public throughout the year.